Include a Save The Date Magnet with your wedding invitations to remind guests of your special day. Remind your friends and family to save the date with these magnets that they can put on their refrigerator and express your unique style and personality at the same time. We offer a wide range of styles and sizes. Improve attendance for your event with a full color date saver event magnet. Give us a call (706-374-0710) for a FREE quote and to put our years of promotional and advertising experience to work for you. 4-color process digitally printed event magnets printed on a white, flexible magnetic material. This material is intended for indoor use only. Material thickness is approximately .019". Production Time: Approximately 6 working days after proof approval. 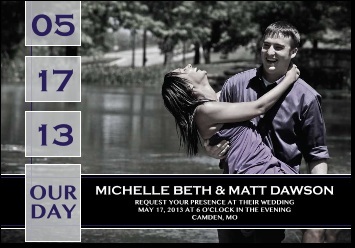 4" x 3-1/2" Die Cut Date Saver Magnets for Wedding and Any Special Occasion. A $20 non-refundable artwork layout charge must be paid before work can begin on all orders with approved digital artwork. Art Preparation: If high resolution vector art cannot be provided, additional charges may apply. To order date saver magnets, call us at (706) 374-0710.